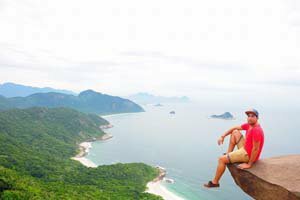 In our series of interviews, we ask foreigners living in Rio de Janeiro questions about how they ended up living in Rio de Janeiro and collected tips of do’s and don’ts around Rio de Janeiro. They also give us inside tips about places to visit and restaurants to go, as well as things to try while in Brazil. I am from Tangier, Morocco. When was your first time in Rio de Janeiro, and what was your first impression? My first time in Rio de Janeiro was September 27, 2016. I came from Istanbul after visiting lots of other countries. I was excited to visit beautiful Rio de Janeiro. I remember my first impression right before landing at the airport at night, I looked from the window of the plane and was amazed by the beauty and magnificence of the view from above. Since when you’re living in Rio de Janeiro, and where? Since March 16, 2017. I am living in Copacabana. I didn’t know how to say any word in Portuguese when I came to Rio for the first time. Therefore I decided I should learn the language. 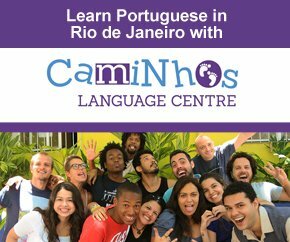 A friend of mine told me about Caminhos Language Centre and it was really the best choice ever. I took a total of 400 hours of Portuguese course and now I speak very good Portuguese. What is your profession and how do you sustain yourself? 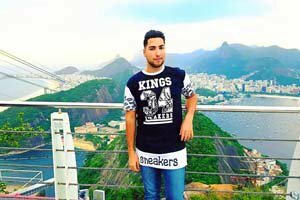 I’m studying International Gastronomy in Rio and trying to set up a small business as a chef at the same time. What do you like the most of the Cariocas? Cariocas are awesome! They are full of energy, happiness, fitness and they like to help out a lot. What is your favorite place to drink a coffee in Rio? I enjoy drinking my coffee at Lagoa or Forte de Copacabana. Sometimes on a hotel’s rooftop in Ipanema. All of the places are beautiful. To which restaurant would you bring someone on a romantic date? Fogo de Chão in Botafogo. What’s your favorite Brazilian food or drink? What should foreigners try? I have a long list, but my favorites are açaí, acarajé (street food from Bahia with dried shrimp), pão de queijo (little bread filled with cheese), moqueca (fish stew from the Northeast)), churrasco (barbecue) and brigadeiro (traditional Brazilian bonbon). Everyone should at least try açaí, brigadeiro and churrasco. Which book/movie/documentary related to Rio de Janeiro/Brasil did you like to read/watch? City of God, Tropa de Elite and Tainá. Which Brazilian music do you like? I like Samba, funk and MPB (popular Brazilian music). What’s your favorite place to go out/dance? I go to different places, like Lapa, Santa Teresa and Pedra do Sal — the most popular places in Rio. 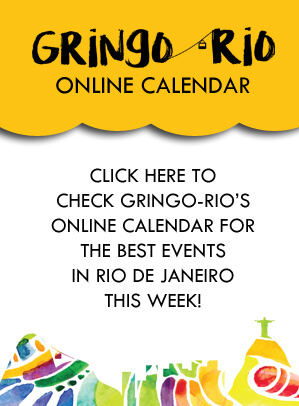 What would be your advice of things to do for someone who’s coming to Rio for the first time? I would advise them to get some information about the city before coming here, like the tourist attractions they should visit. Also, learn some words in Portuguese, like “oi” and “obrigado” because here in Rio most of the people don’t speak English. Which of the following getaways close to Rio do you prefer: Búzios, Paraty or Ilha Grande? I think all three locations are very beautiful. Búzios, however, I loved. 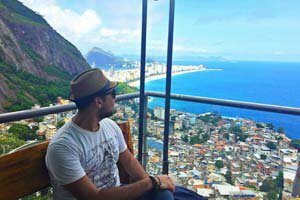 What things to do around Brazil/Rio? Travel and discover the country, the culture and the food. Did you already go to any other state in Brazil? How was it? Did you liked it? Yes, I did. I went to Salvador (Bahia), São Paulo, Curitiba and Foz do Iguaçu (Paraná) and Bonito (Mato Grosso do Sul). Every state is different than the other and I liked every city I visited. Would you stay in Rio for the rest of your life? I would advise them to avoid walking alone late at night, especially on the narrow streets. Do not take things of great value with you and use taxi, uber — it’s not expensive at all — or the subway. And enjoy your stay in Rio!